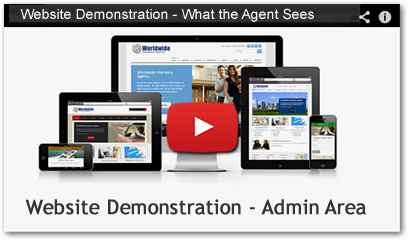 We’ve made insurance websites easier for agents. Easy setup. Easy management. Easy pricing. Shoppers and customers can visit your site, request quotes and contact you from any device, anywhere. 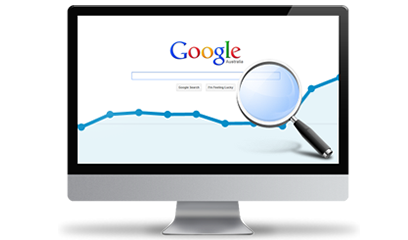 Insurance shoppers and current clients will find your website when they search for insurance on Google. Gain trust and credibility with an SSL certificate that helps increase lead generation. You don't have to sign away your life to us. You'll be happy working with us month after month. Fill out a one page form about your agency. It takes about 5 minutes. We'll build your agency a custom website to review in 2 business days. Give us feedback and we'll make whatever adjustments you ask for. When you're ready, pay the first month's bill and we'll launch. Our websites are easy to update yourself but we'll always be there to help. No extra charge. 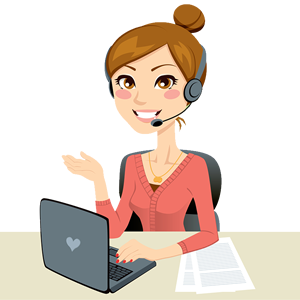 24/7 Website support ticket system so you can request help from us at any time. Phone support during regular weekday office hours if you need to discuss something. Over 40 online tutorials for the most common website edits so you can do it yourself. 3 Hours/month of website customizations so you don't have to do anything if you don't want to. Check out our Client Support Center to learn more. No Setup Fees - $59.99 Per Month - No Hidden Fees! 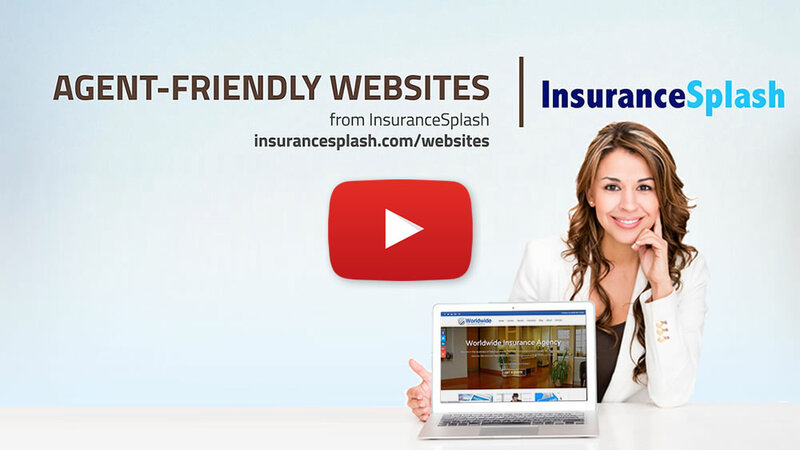 What do insurance agents think of InsuranceSplash? Click Here to read Agent Testimonials. Want Help Getting Traffic? We do that too! For a limited time we're offering free access to our 60 day online marketing program built for insurance agents. We'll show you exactly what to do to make Google love your agency in 60 days. An SEO blueprint developed specifically for local insurance agents. Interactive system tells you where to go, what to do, and tracks your progress. No other insurance website comes with ANYTHING like this! 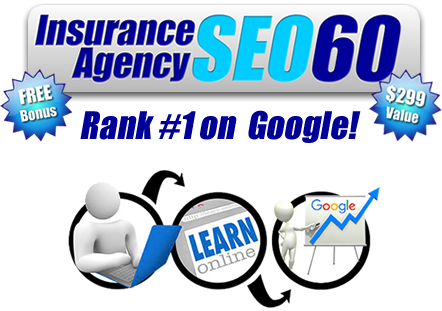 Check out our Insurance Agency SEO60 Page to learn more. $59.99 per month. No setup fees. No hidden costs. On occasion we do charge extra if an agent needs complex custom programming or help with a large project that is going to take us several hours but that's VERY rare. If an agent uses any third-party services from other companies with their website they could incur additional fees but that's between the agent and the other company. Examples include online raters, email accounts, online chat services, email marketing services. Step 3: You provide feedback and we adjust the site until you approve it. Step 4: We send the first month's invoice ($59.99) and launch the site as soon as it's paid. Do you guys offer marketing/SEO services for the website? Although our websites are built extremely well optimized for Google to begin with, we offer additional online promotion packages that include the perfect combination citation building, content creation, social media, and other online promotion techniques to get your website out there in front of as many people as possible. Check out our Insurance SEO Services Page to learn more. There is no catch. No hidden fees. We're profitable and can't speak for the competition. We've spent a lot of time streamlining our processes for building sites and our website management system is so easy we don't have much customer service work after our sites go live. We will raise prices for new websites in the future but your monthly rate will never change from the day you sign up with us. I already have a domain and email, do I need to change it? No. 99 times out of 100, we can launch a website without transferring the domain name or interfering with existing email in any way. As long as you can get us access to the domain account we'll take care of everything. The most common scenario when this becomes an issue is if your current insurance website provider controls your domain name and won't allow you to control where it points to. In these cases we'll work with you to transfer ownership of the domain to a new account where it'll be under your control. We'll take care of everything for you if you want. I don't have a domain name. Is that a problem? No problem. We'll acquire it for you and if you ever want control of the domain from us we'll gladly transfer it to you. Not directly. But for no additional fees we'll help you get setup with an email system from Gmail, Outlook, or any other third-party email service you'd like to use. We recommend Google email because it's the easiest, the most reliable, and has the best SPAM filters. We also have free email services available that we setup many clients with. What is included with the free setup and customization? Change the design's color scheme to match your preference. Remove any mentions of products and services you don't offer. Upload all your carrier logos with links to the carrier websites. Add your agency logo (if you have one) at the top. Sync up the website with your online rater (if you have one). Replace all agency contact information site-wide with your own. Remove any pages or sections you don't want (blog, news, staff photo gallery, etc.). Update all social media links to your agency's social media pages. Adjust all maps to display your physical location or city center. Replace images anywhere on website with images provided by you. Program all quote, service, and contact forms to send automatic notifications to your email. Customize SEO-related meta-tags to target your physical location and products. What is NOT included with the free setup and customization? We believe very strongly in NO HIDDEN FEES and NO SURPRISES. If you request any customizations that warrant additional fees we'll let you know in advance. Can I have custom colors on my website? Of course. We can make anything on your site any color you want. We'll usually try to match website colors with your logo but we're flexible. What will I be able to edit myself after the site goes live? We'll do all the work of building your new site and will still make any changes you want after the site goes live. Add code to the header or footer of any page. Do I have to do all the website updates myself? Or can you guys help? Our website system is so easy you'll be able to update practically anything yourself, but you don't have to. We're happy to step in and help with things you can't do, or don't want to do. If you need us to do something that'll take several hours we may charge a nominal extra fee, but for the most part we love helping clients for free! What if I need help making a change to the site? No problem - We'll help you. Just because you CAN update it yourself doesn't mean you're on your own. We help our clients make changes to their websites every day! How long does it usually take for website updates to be made? 1-2 Business days. Unless it's a particularly large project that we need to block off a large amount of time for. Optimized Title Tags - every page on the site has a unique title tag that was written using the most popular keywords for that type of product or service using search volume statistics from Google's Adwords tool. Meta Descriptions - These are invisible on the site but they show up on Google as the text below the link in the search results. We've written individual meta descriptions for every page to entice the Google user to click through to the site. Physical Address Optimization - We use your USPS verified address on every page of the site in a place that it's clearly visible to Google Spiders so google knows you are the business they think you are. Regional Customization - We input regional location words into strategic locations within the visible parts of the website everyone can see and the hidden code parts that Google looks at. We do this in a way that's clear to Google and not overdone for the reader. Optimized Image Alt Text - we use Alt Text associated with images on every page of our sites to provide more keywords relevant to the product that page is trying to rank for. Insurance Carriers - We list every carrier our agents work with and include a link to their website to improve the agency's ability to rank for people search for a "progressive agent" etc. Site Structure - Our sites have a very clear hierarchy of pages with the main pages going across the top of the menu and subpages below it. 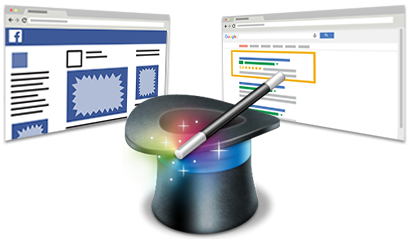 The more clear it is to Google about how your site works the better you'll rank. Mobile-friendly - Our websites display a mobile-friendly version of each individual page that matches exactly the content on the desktop page. This is Google's preferred method for mobile sites. Clean Links - We don't use any links that can't be followed by Google's spider robots within the site. Webpage Speed - Our websites load in under 4 seconds. It could always be better but that's quick enough to avoid penalties from Google. Social Media Connections - By linking your site with your social media networks, it provides a clear picture to Google of both your website's footprint but also your social media footprint. If this is large it can help your SEO. Business Hours - Google is more likely to show your business in search results when they can confirm that the operating hours of your agency they have in your business profile matches what's on your website. Dynamic Sitemap XML file - This is a file your site comes with that only the Google Robots can read. It tells them all the different pages of your site so they know where to look and this file will update if you add new pages. Driving Directions on Mobile Site - One thing Google looks at to determine the popularity of your business is the number of people who search for driving directions to get there. By putting it on the mobile site we can effect user behavior and send positive signals to Google. Robots.txt file - This file tells Google they are free to search through the site. Whether this really helps SEO is questionable, but Google has said they like it and it certainly doesn't hurt. Can you build the site using pictures of people who match my target audience? Of course. The people on your website should look like your target customers, right? We can't change ALL the pictures EVERYWHERE and still offer free setup, but we will replace homepage images and pictures on the most popular pages of the site (Contact us, About Us, etc) with those that match your target audience. We've found doing that gives the site a completely different feel. If you want to switch out every picture on every page that's cool with us too. We'll do it for free if you provide the images or if you want us to we may need to charge an "image finding" fee and pass on the out-of-pocket royalty fees to you. Once the website goes live you'll also be able to replace just about any picture you want by yourself. Do I need to have a blog on my site? You can add or remove any pages to the site you want to and if you let us know you don't want something we'll remove it before the site is even launched. Can you add additional insurance carriers to the site? What happens to the information people fill out in quote or service forms? It gets emailed right to you immediately and will be stored in the admin section of the site in case you lose the original email. Will my website have an SSL? Yes, your website includes an SSL at no additional charge. With the SSL your site will appear with an "https://" in front of it. Are all the images on the website royalty-free? Who is liabile if there's a copyright dispute? Stock photos for which we've purchased the legal rights to use and can prove it any time. Royalty-free images like Wikimedia Commons. Images that have been provided to us by the client. We assume our clients have legal rights to any images they provide to us for use on their website. Because we can't control what images our clients upload to their own websites, we are only liable for the legal use of images we source and put on the site. We work with multi-location agencies all the time. It's no problem for us. The approach we take depends on how many locations there are, whether all locations deserve equal prominence, and the agent's preference.